Steve Beshear continues to follow the KY Homeland Security law that has been declared unconstitutional. 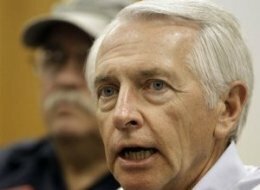 Kentucky Governor Steve Beshear’s 2010 Annual Report of the Kentucky Office of Homeland Security includes religious statements that were ruled unconstitutional by Circuit Court Judge Thomas Wingate. You can click on the link below and read the Protection Statement on page 2. In previous years, Governor Beshear had included this language in a supplement. For some reason, he promoted this language to page 2 AFTER it was ruled unconstitutional.